Ram is a genre-leading, multi award-winning dance music record label primarily releasing Drum & Bass music. Established in 1992 by Andy C with the help of close friend Ant Miles, the label and business today is run Andy C and business partner Scott Bourne (Red One). As well as Ram’s musical output, the label is also very well know for its legendary club nights at high profile venues such as Matter and Fabric. 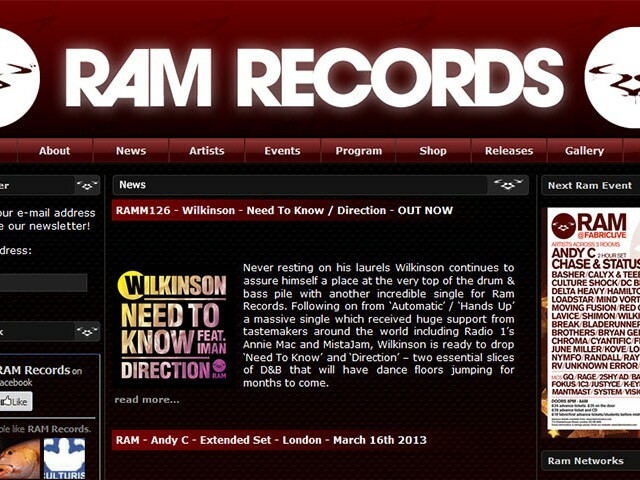 Since 2009 Clocked Web Development has provided the technical and design expertise in association with Underground-Music.co.uk to deliver Ram Records an effective web presence to showcase their label and artist roster. Built on the Joomla CMS platform and extended with K2 to provide easy in-house management of news, artists and discography, the Ram Records website is always undergoing updates and further developments as the label continues to grow and dominate the industry.